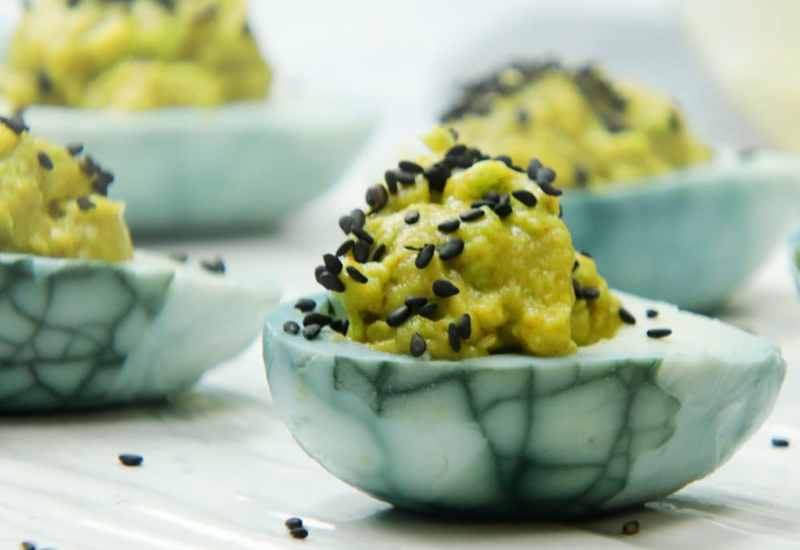 The technique in this recipe gives you deviled eggs with blueish-grey veins and a green avocado filling, making a frightfully fun and delicious treat for your Halloween gathering. Substitute avocado for egg yolks for a heart healthy filing. Per Serving: 72 calories; 5g fat; 4.8g carbohydrates; 4g protein; 93mg cholesterol; 127mg sodium. I double this recipe to make one dozen hard boiled eggs. They turned out so cool! I just used simple salt and pepper for the avocado. This will be on my list of things to make every Halloween! This technique worked perfectly! I prepped the eggs in the morning and by that night they had soaked long enough in the blueberry liquid for the veins to show. Such a unique idea, no one else at the party used this same idea.